Saturday was our last Riviera ride of the year, supposedly (more on that later). 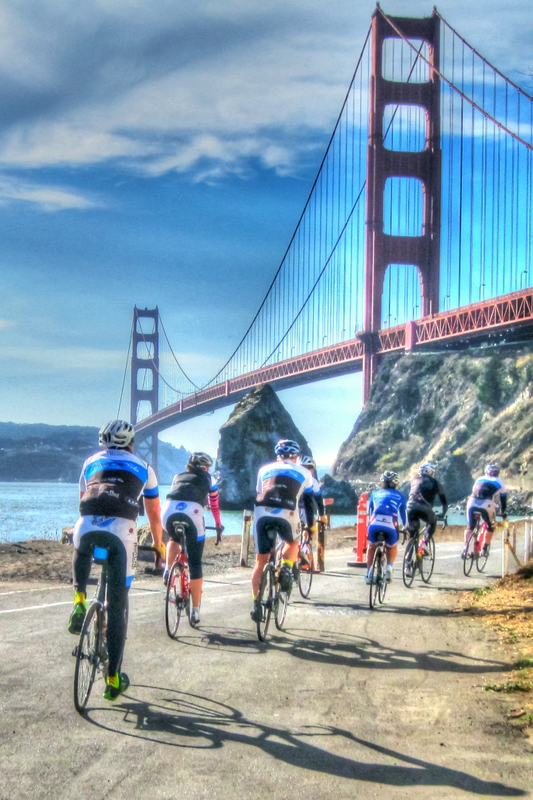 You may recall these rides started almost two years ago and were a big part of catapulting me deeper into the Sonoma County cycling community. They are fun, social, and end with a great lunch at Riviera Restorante. They are also hammerfests. These rides always draw a decent crowd and Saturday was no exception. In addition to my Team Revolution mates, there were riders from the Red Peloton and Team Colavita/Baci. We had at least a handful of Cat 3 riders or higher in our mix. Add to that a fairly flat course and the boys and girls can’t help themselves so up and up goes the pace. We all gather at West County Revolution and after announcements and a lunch count we are off. The pace was a little brisker then normal straight out of the blocks so I knew we were in for a treat. And by treat, I mean you would be wiped out if you tried to hold on for too long. As we rolled along the bike path to Forestville, the B riders were already splintering pretty badly as some tried to keep up with our A group and some did their own thing. In Forestville, I noticed just how strung out we were. So I told Jon, our main team leader, that I would hang back and see how everyone was doing. It was then we heard that a rider went into a ditch but everyone thought he was ok.
After a few more minutes Adam, a teammate and very strong rider, and I decided to ride back to see what was happening. Long story short, one guy did fall and he was fine but threw a spoke and his back tire wasn’t true. He was with a group of three others and just trying to make it through the day. A few miles later, he and his friend decided to go into Windsor and get the tire fixed, which left me with three riding partners and I immediately knew I was in trouble. It was a B ride leader’s worse nightmare. I was now in a group with myself, a Team Colavita rider, a Red Peloton Rider, and Adam (I think the Colavita and Red Peloton guys are both Cat 3s). As soon as we started rolling the Colavita rider went to the front and hammered the pace. I was watching my cyclometer was we reached 24, 25, 26, and then 27 mph. I was fourth in line and just barely hanging on. Then we hit a small hill that they charged up at 20+ mph. About half way up the climb I completely popped and watched them ride away. However, I was pretty happy that I held on as long as I did. At this point we also caught some of the slower B riders so I spent the next few miles leapfrogging from one group to the next and making sure everyone was doing ok. At Hop Kiln Winery I picked up Miriam and we picked up the pace and managed a respectable 20+ average for the next 5 miles to our regroup. There, the A group continued on and the B group headed for food. We picked a casual route back and the ride became much more social as everyone had already put in big efforts. Back at Riviera, the lunch was awesome as is always the case. We ate, drank, laughed, and chatted with friends with just a touch of sadness knowing this was the last one of the year. However, as I was leaving Steve (from WCR) said that Riviera wanted to host one more in October so we get to do this all again in a few months. There is one last connection to the title from the day’s events. After lunch I posted on FB that after a great ride and lunch it was hammock time. One of my cycling friends made a reference to hammer time. That’s all it took. Next thing you know I am performing in Oakland and have my Halloween costume all set. I really do love this aspect of cycling. Hopefully, they can all join me on the October Riviera ride where I will do the best impression of hammer time that I can. Until then, I better start practicing. oh, snap, you put it in WRITING! Now you have to do it! Bring your parachute pants!! But seriously, I think next time we do this ride, we should make it a point to tell the group to take it easy until the point where the groups split. Especially on the bike lane or going through stop signs/lights...people get split up so easily! Tough to manage a huge group like that. Glad you guys had a good ride and good job keeping up with Michael!